I must say when I started playing Ghost of Sparta just over 6 hours ago I didn't expect I would play through the entire thing in one sitting. I reached that rare state of being in the zone when food and drink become unimportant, where all that exists is the game itself, wonderful stuff, now if only I could do that for the couple of hundred other games on my to play list! 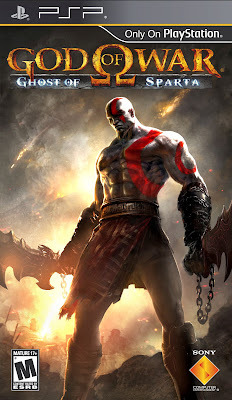 Ghost of Sparta takes place after the events of God of War. Kratos; now the God of War after defeating Ares gets a strange vision concerning his past. Ignoring Athena's pleas to forget about the visions Kratos sets out to Atlantis. There he finds his Mother who tells him that his brother believed killed as a child is actually still alive and is a captive of Thanatos (the God of Death) in the realm of the Dead. As a child Ares and Athena kidnapped the brother (Deimos) as it was foretold that a Spartan with markings such as his would cause the fall of Olympus. To get to the Realm of the Dead and save his brother he must travel to Sparta, to the Temple of Ares and retrieve the key stored there. This is such a great game, when I started playing at 1pm I never expected I would fall in love with it. 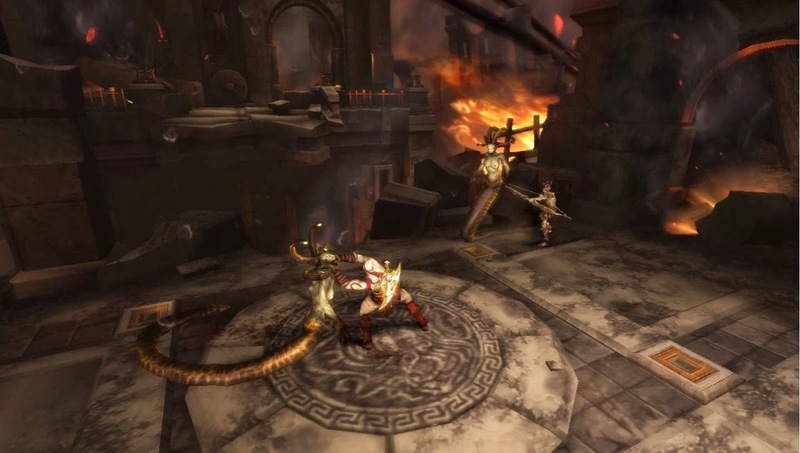 Chains of Olympus had to be honest pretty terrible graphics, even HD'd up they were bland and featureless but here they are so much better, this looks like a PS2 game, the graphics really quite pretty thanks to the HD treatment. Locations are interesting if a little thematically inconsistent, starting off in Atlantis (watery as you would expect) I soon found myself in a giant volcano and somehow caused Atlantis to be sunk under the waves. Crete and Sparta also feature as well as snowy mountains, and the Realm of the Dead which really gets bigged up as a damn scary place but is actually just giant temples and living tree roots. The trip into Sparta takes a leaf out of Uncharted's book, it is a safe place, people go about their daily business and your forced into a slow walking pace, a nice break I guess but I was itching to get on with the killing! 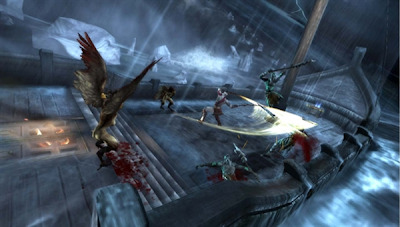 For the most part the same enemies as previous games are used, albeit with different designs. Minotaurs, Cyclops monsters, Soldier Ghouls and Snake Women all turn up at various points and are joined by fun Jason and the Argonaut style skeletons that reassemble once killed, bird like flying creatures, and plenty of Frog Men. Bosses are fun and look great, an early re-occurring battle against a giant sea monster was a highlight for me. 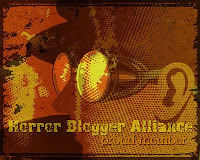 As is always the case all the monsters you face can be ripped apart in a violent finisher. The QTE events are a lot easier this time around, no fiddly analogue twirls for the most part. As is always the case killed enemies release experience orbs which can be used to upgrade your blade chains and increase your magic (this time around the magic features the Wind of the North, a black hole type projectile, and a concentrated cone of electricity). A new thing that was later used more in Ascension was the ability to turn your blades into flaming ones, using fire swords is the only way to open certain doors, and the automatons you fight can only be destroyed by flame attacks, which also applies to armour of your foes. A nice touch was that the flame attack also causes a delayed reaction bomb attack. For whatever reason the PSP God of War games have reduced difficulty to the console ones but it is never at a point when it is boring. I died a few times, mostly mistiming jumps, never from actual combat. It was so enjoyable though that the reduced challenge did not bother me, on the contrary it helped me enjoy the adventure more. It has simpler puzzles, mostly of the finding a key variety but has some genius moments. A section where your hunting down King Midas, following a trail of golden hand prints and golden monsters is so much fun, the payoff; well all I can say is I feel sorry for poor crazy King Midas; a standout moment though. Probably my most favourite God of War plot yet. 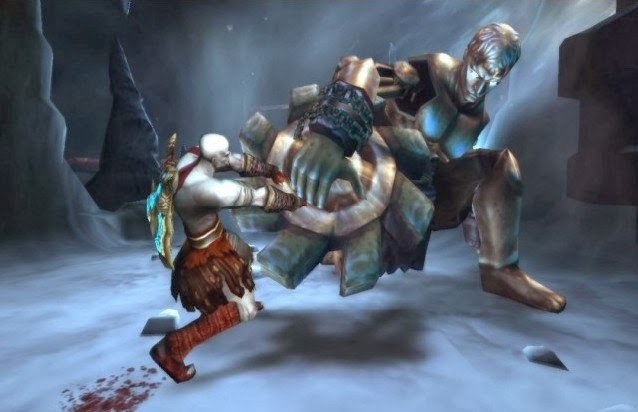 While the actual journey to rescue your brother may be a little simple it is good at setting up Kratos as an enemy of the Gods. He openly agitates some Gods without caring (sinking Poseidon's beloved Atlantis for example) and ends his quest visibly angrier than when he started. While it does feel like a side story it is never to the extent the forgettable Chains story did. It is so rare to find a game that you literally cannot stop playing, as I mentioned I simply did not expect Ghost of Sparta to be one such game, it blew me away. 6 hours of pure fun; such a rare thing nowadays!